It’s another icon of Rome and one of the most impressive ancient structures you’re ever likely to see. Sadly, part of the outer walls fell down in an earthquake, but there’s still plenty left to get a feel for what the Colosseum would have been like in the days of the Gladiators. We think the building is most impressive on the outside, but it’s still worth a trip inside too. 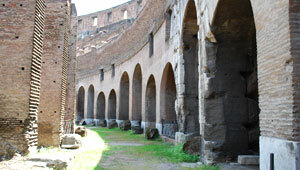 55,000 Romans would have squeezed into the arena and when you’re inside you can see how they would have all fitted in. You can’t help but be impressed with the building, but we felt that more explanation of the lower parts, which would have been underneath the original floor, was needed. These are the bits now covered in grass (pictured above) and it was a shame that there is no public access here. This is another building where you’re likely to find a long wait to get in, but taking the audio tour or an official guided tour costs only 4 or so Euros extra (2010 prices) and means you bypass the line. We took an official guided tour, but the guide’s English wasn’t great and we wished we’d gone for the audio tour instead. As such we learned little from the guide, but the experience of being there was one we’ll never forget. The Colosseum opens every day from 8.30am, closing from April to August at 7.15pm, in September at 7pm, in October at 6.30pm, in November, December & January at 4.30pm, from February 16th to March 15th at 5pm and from March 16th to the last Saturday of March at 5.30pm. Standard admission is 12 Euros (2010 prices). Your ticket will also give you access to the ancient Roman ruins in the Forum and at Palatine Hill so make sure you keep it handy. We saw some people paying extra for these attractions without realising their ticket covered both. Bear in mind that there is little shade in the Colosseum, so on hot days, you really feel the effects of the sun. The nearest metro stop is Colloseo. The Colosseum is opposite the Roman Forum and is served by major bus routes and tour busses as well as the Metro stop mentioned above. It is a short walk from the huge white monument which marks the first king of a united Italy (Monumento A Vittorio Emanuele II). This landmark can be seen around most of central Rome.